The US and France threatened a “joint, strong response” to the alleged attack. 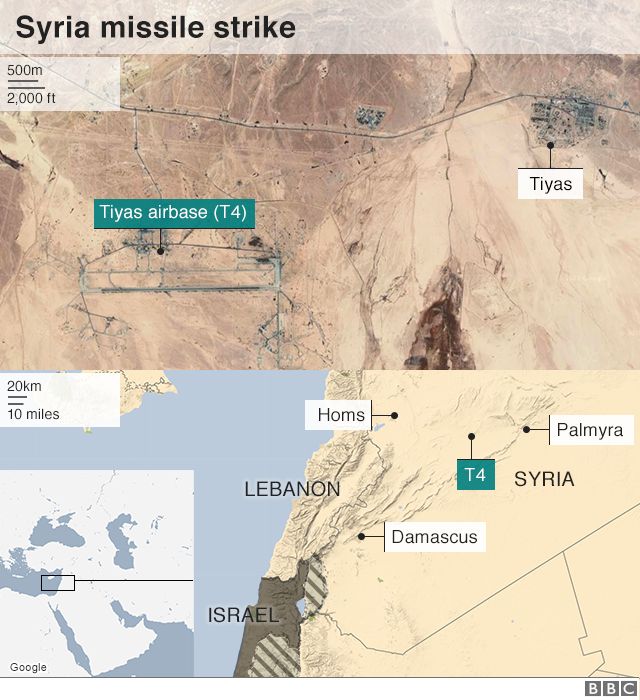 It hit the Tiyas airbase, known as T4, near the city of Homs. Observers say 14 people were killed. Israel, which has previously hit Syrian targets, has not commented. Syria initially blamed Washington for the strike, but the US, UK and France have all denied involvement. Unverified video [below] shows children being treated after the alleged gas attack. This video contains graphic content. Viewer discretion is advised. What has been the reaction on Douma? US President Donald Trump said there would be a “big price to pay” for the alleged attack in Douma, in the Eastern Ghouta region, near the capital Damascus. He branded Syria’s President Bashar al-Assad an “animal”. Along with France’s President Emmanuel Macron, he issued a joint statement on Sunday vowing to “co-ordinate a strong, joint response”. UK Prime Minister Theresa May’s spokesman said Britain was working with its allies on the response. Meanwhile Ahmet Uzumcu, head of the Organisation for the Prohibition of Chemical Weapons, expressed “grave concern” about the alleged attack. The OPCW is currently gathering information about the possible use of chemical weapons. Mr Lavrov said that the Russian military had warned many times of a “provocation” being prepared, aimed at putting the blame on Damascus for the alleged use of chemical weapons against civilians. “Our military specialists have visited this place, along with representatives of the Syrian Red Crescent… and they did not find any trace of chlorine or any other chemical substance used against civilians,” he said. Moscow favoured an “honest investigation” of such incidents, he said, but opposed apportioning blame without any proof. Medical sources say dozens of people were killed on Saturday in Douma. However, it has not been possible to verify independently what actually happened, or the number of dead. Syria and Russia have reached an evacuation deal with the Jaish al-Islam rebels, who up until now have been holding Douma. What about the airfield attack? Syrian state news agency Sana, quoting a military source, reported that air defences had repelled an Israeli missile attack on T4, saying the missiles were fired by Israeli F15 jets in Lebanese airspace. It said there were casualties, without giving a number. UK-based monitoring group, the Syrian Observatory for Human Rights, said that fighters of various nationalities – meaning Iranians or members of Iranian-backed Shia militias – were among the 14 dead at the base. Israel rarely acknowledges carrying out strikes, but has admitted attacking targets in Syria dozens of times since 2012. Its heaviest air strike on Syria, in February this year, included targeting the T4 air base.